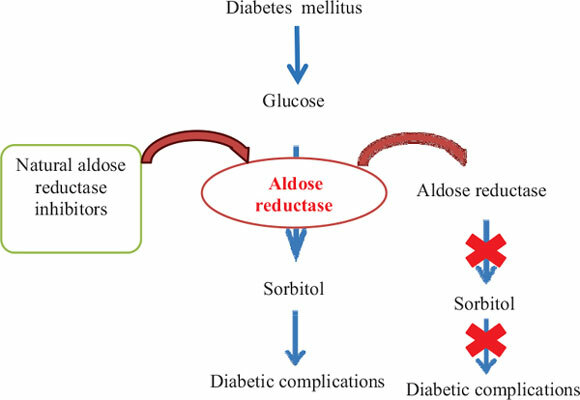 Background: Aldose reductase is the key enzyme in the polyol pathway, it is implicated in the development of complications associated with diabetes. Objective: The aim of this review is to classify the medicinal plants and their phytoconstituents used in the inhibition of aldose reductase. Methods: We reviewed 83 papers published between 1997 and 2015 (PubMed and Sciencedirect). All the molecules structures were provided in ChemDraw software. Results and Conclusion: In this work we have listed the experiments that have showed therapeutic effect of aldose reductase inhibitors against complications associated with diabetes. We concluded that aldose reductase inhibitors have common components that are responsible for their inhibitory activity. Quercetin, Luteolin 6-C-(6´´-transcaffeoylglucoside), 1,5-di-O-caffeoylquinic acid, Quercetrin, 3,5-Di-O-caffoeylquinic acid, chlorogenic acid, 3,4,5-tri-O-caffeoylquinic acid, kuraridin, Methyl-3,5-di-O-caffeoylquinate, 3, 5-di-Ocaffeoylquinic acid, isoquercitrin, kaempferol-3-O-[2", 6"-di-O-(E)-p-coumaroyl]-β-D-glucopyranoside, desmethylanhydroicaritin, kaempferol-3-O-[2", 6"-di-O-(E)-p-coumaroyl]-β-D-galactopyranoside, casuariin, casuarinin, Luteolin, Methyl-3,5-di-Ocaffeoylquinate, Lavandulylkaempferol, 3,5-di-O caffeoylquinic acid methyl ester, kushenol C, and Desmethylanhydroicaritin showed significant inhibitory potential of aldose reductase. Medicinal plants, diabetes, aldose reductase inhibitors, phytoconstituents, diabetic complications, chemdraw.